The HP LaserJet 600 m601 printer has Automatic Duplexing feature using which it can print on both sides of a page without the need for flipping the pages after printing on one side. Instructions for both manual and HP LaserJet 600 m601 duplex printing is provided below. Open the document to make a print. Select the printer’s name and click Properties or Preferences. Click the Finishing tab in the next window that opens. Check the Print on both sides (manually) box. Now click OK. The printer will begin to print on the first side of the page. Remove the printed page from the output tray and reload it into the input tray such that the printed side faces up. Press OK on the printer’s control panel to begin printing on the next page. Power up the printer and wait until it is silent. Make sure the ink cartridges are correctly installed. Pull the paper input tray out and load enough paper into it for HP LaserJet 600 m601 duplex printing. Turn your computer on. Now open the document that you want to print and click the File menu in the software application using which the document was opened. Click the Print option and select the printer’s name from the list of printers displayed on the Print window. Click the Properties tab displayed on the right of the Print window. Now select the Finishing tab on the top menu bar. Check the ‘Print on both sides’ box under the Document Options tab and click OK. The printer will begin to print the first side of the page. Once the first side is printed, remove the printed page from the output tray. Place the page in the input tray such that the printed page faces up. Press OK on the printer’s control panel. The printer will now start printing on the other side of the page. Follow the guidelines provided below for performing automatic duplexing on the HP LaserJet 600 m 601 printer. 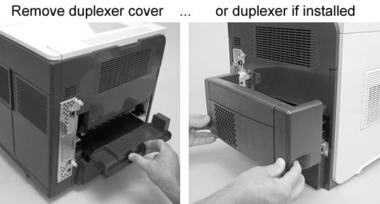 Before proceeding, make sure you have installed the automatic duplexer into the printer. Open the document that you want to print and click the File menu followed by the Print option.Select the printer’s name in the Print window and click the Properties tab. Hit the OK button. Now click the Finishing tab on the top menu bar and select the ‘Print on both sides’ checkbox under the Documents Options section. Choose an appropriate orientation and finally click OK to initiate automatic HP LaserJet 600 m601 duplex printing. The printer will automatically print on both sides of the page.